Always handmade, all natural and preservative-free. Ingredients: Unbleached flour, Peanut Butter, Bananas, Eggs, Honey, Canola Oil. Frosting: Cream Cheese, Confectioner’s Sugar, Sesame Seeds (confetti), or Carob Chips. Ingredients: Unbleached flour, Peanut Butter, Bananas, Carob, Eggs, Honey, Canola Oil. Frosting: Cream Cheese, Confectioner’s Sugar, Sesame Seeds (confetti), or Carob Chips. 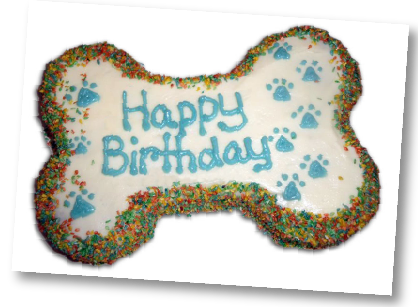 Celebrate with the dogs you love! 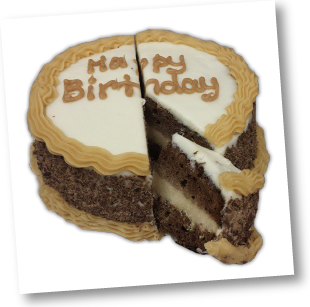 Our birthday cakes are always handmade, all natural and preservative-free. Ingredients:Peanut Butter, Banana, Eggs, Honey, Canola Oil. 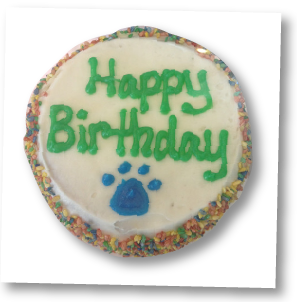 Frosting: Cream Cheese, Confectioner’s Sugar, Sesame Seeds (confetti), or Carob Shavings with Peanut Butter Frosting. A layer of homemade peanut butter ice cream between layers of delicious pb-banana cake. Topped with carob shavings and pb frosting, of course! Ingredients:Peanut Butter, Banana, Eggs, Honey, Canola Oil. 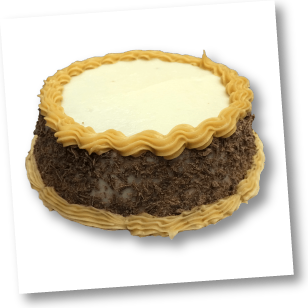 Frosting: Cream Cheese, Confectioner’s Sugar, Carob Shavings with Peanut Butter Frosting. Please allow 3 days (72hours) when ordering. You may pick up your cake on or after this date, it will not be available sooner. SORRY FOR THE INCONVENIENCE, please edit date to mm/dd/yyyy manually. This area is under repair.